Six deacons ordained in the Philippines | Walk with us! Friday’s celebrations were simply marvelous! The parishioners of St. Isidore the Farmer did themselves proud in providing a wonderful liturgical atmosphere for the six deacons-to-be and their families. Obviously it was much easier for the four Filipinos to have their families attend the ordination. Though I’m not sure, I believe the majority of them come from the island of Mindanao since that’s where we have our major presence — although two of the three Filipino students I have in my class come from near Manila on Luzon. That’s not to say their Vietnamese brothers did not have family present and even though English and/or Cebuano are foreign to them they seemed to fit right in enjoying and watching their sons and brothers being ordained deacons by Archbishop Al Sudarso, SCJ, of Palembang, Indonesia. I wish I had enough bandwidth to embed a short video I took at the start of the Mass. Friday marked the third day in a row where we had heavy rains during the late afternoon, usually between 3:00 p.m. and sunset. Friday saw the heaviest downpour though with less thunder and lightning. The roof of the new church is metal and does not have much, if any soundproofing and the din the heavy downpour made in the church almost drowned out the singing and praying. Luckily the church has a good sound system that could rise above the deluge Mother Nature was dropping from the sky. 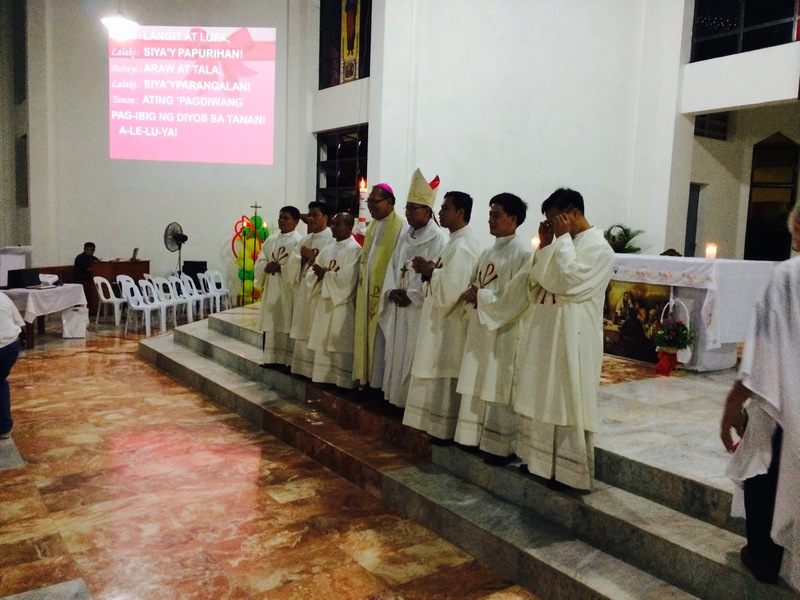 Bishop Emanuel Cabajar, CssR, of Pagadian concelebrated the Mass and preached. This time he did it in English. The Mass and ordinations took about two hours. Thanks to the rain the temperature in the church was rather comfortable. While we had fans near us the outlets have as yet been hooked up leaving the fans as mere decorations — thank goodness the rain cooled us down. After Mass we returned to the old church, which served as our dining hall with the same Pagadian catering service handling the reception. As with the two previous meals they served, this one was heavy on meats and rice but no vegetables. However, there were at least two or three kinds of fruit, especially pineapple and watermelon. As we foreign guests have learned, any celebration would be a disaster if roasted pig were not there in abundance. We had two for the crowd to devour. I went up once or twice to try to get a piece but I couldn’t get near the action. Clearly the Filipinos love their roasted pork and nothing goes to waste! We were also lucky the rains stopped several hours before we headed over to the gym. You did have to watch where you walked once leaving the main road as it then became a dirt track. Once again my smartphone came in handy not for calling but for seeing – I used its built-in in flashlight. As for the show itself, the members of St. Isidore the Farmer’s parish and its many chapels did themselves proud. The show opened with an adult choir, that included our own Br. Yohanes Baptista Sismardi, SCJ, singing the Philippine national anthem. This choir would make another appearance during the course of the evening as one of the adult acts. Immediately after the national anthem a prayer/dance was offered as the benediction for the evening. Dance would play the most important part of the evening’s entertainment. 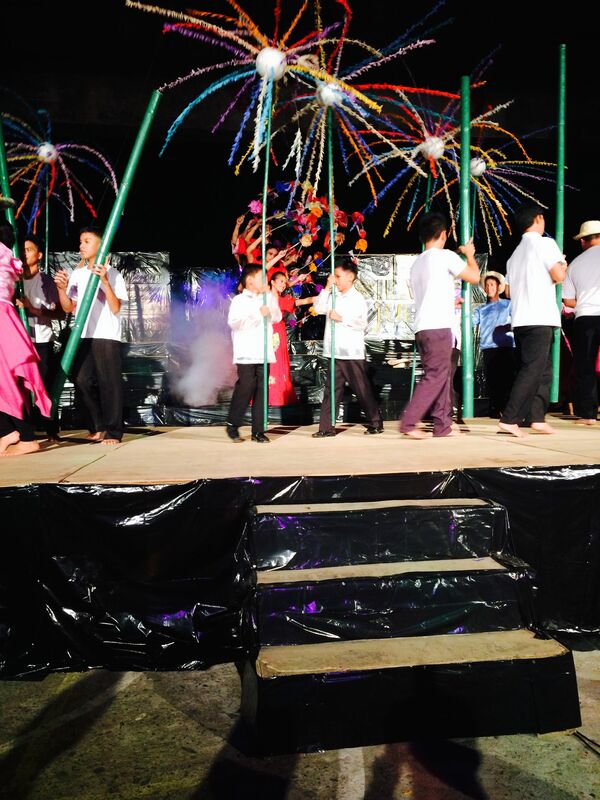 The show lasted about two hours and interspersed between some of the acts was a narration of the 25-year history of the SCJ presence in the Philippines. During the course of the show we had young girls (maybe between 8 and 10) come by with water and sweets for us to enjoy. As the SCJs were the honored guests we were seated in the front row on chairs in front of the bleachers and close to the stage.